With the inclusion of advanced technical knowledge and innovative machines in all our processes, we are engaged in offering Mono Block Pump Set. These pump sets are extensively used to transfer fluids by converting rotational kinetic energy to hydrodynamic energy. 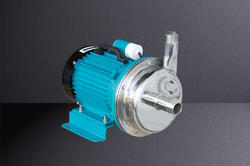 Our pump sets are inspected in terms of quality so as to dispatch a defect free range. We are giving these pump sets in various specifications as per customer’s choices. Looking for Mono Block Pumps ?